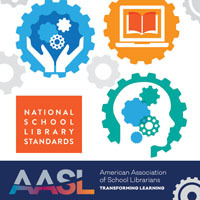 As a school librarian in Alabama, I have been so grateful for the extremely thorough way ALA and AASL have promoted the significance of ESSA (the Every Student Succeeds Act, which has replaced No Child Left Behind) for school l ibraries and librarians across the nation. 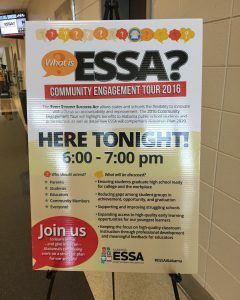 As a result of the emphasis I have seen our national library leaders place on ESSA and as a parent of school-aged children, I was beyond thrilled to see that the ESSA Tour in my state was making a stop in my community and prioritized attending this event, held just last week. The ESSA Tour may look unique to each state; here it includes 8-9 stops around Alabama in various schools and communities. 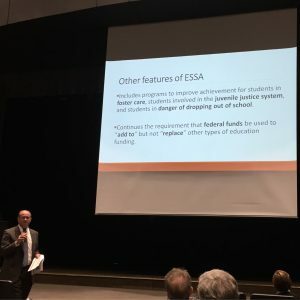 A panel of presenters from the Alabama State Department of Education as well as the Governor’s Office gave a 45-minute talk on the generalities of ESSA, then fielded specific questions from attendees, most of which were from special interest groups. Our presenters shared that the Alabama subgroup for ESSA has met twice already in preparation for implementing this new federal legislation, and a consistent emphasis was placed on each state being allowed to select their own standards and their own measures of achievement. Each state can design their own plan for meeting the requirements of ESSA, and those plans are to be submitted to the US Department of Education by March 2017. For Alabama, the Achievement Measures (standardized testing in the form of ACT, ACT Aspire, ACT WorkKeys) and Accountability (Continuous Improvement Plan) as well as the inclusion of non-academic goals (such as attendance, school quality, and advanced coursework offered) and state involvement in schools that produce consistently low scores in targeted subgroups of the student population all feel very familiar to those of us who have been around the block a time or two in the education world. 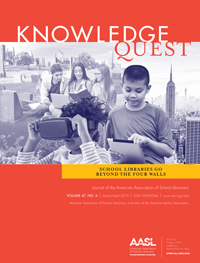 What is new is the language supporting school libraries and librarians (which ALA and AASL have already told us is very important for this legislation) as well as new subgroups that are being targeted under ESSA. We seasoned educators are accustomed to disaggregating data on the basis of poverty level, race, and other demographics. Now, under ESSA, children in foster care, those in military families, kids involved in the juvenile court system, and English Language Learners are among the new subgroups that each state will be held accountable to ensure progress. Though I still have some questions about how that will be conducted, I am grateful to see that these groups of vulnerable children have advocates on the national and state level. 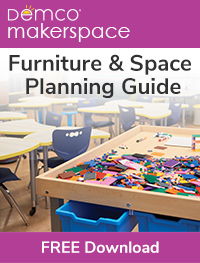 This can only help assure them a well-rounded education experience despite challenges. Although I walked into the auditorium that night intending primarily to listen for and advocate for the role of school libraries among the state leadership (which I did), I left with an appreciation for the new student subgroups and fresh excitement over ideas for supporting them. We as school librarians are uniquely positioned to impact every student in the school, help every parent of every child in the school, and to support every teacher in the building. Sometimes we need to advocate for how librarians can impact students, but mostly we need to just work to actually impact students. I’m glad I attended the ESSA Tour so that I can better serve the kids in my school, and I highly recommend taking the time to become a part of whatever ESSA meeting you can within your own state! My co-librarian and I have been taking turns this week conducting Freshman Orientation with over 300 incoming 9th graders. One of my mantras has been to explain to the kids that our whole job as school librarians is to help them and their teachers whenever, wherever, and however we can. Having a solid understanding of ESSA will enable us to do just that. Comments welcomed through the end of October 2016.